Must See and Do Activities in Atlanta this WINTER! The Atlanta Boat Show – Ha! But seriously, I love going to look at the boats, wakeboards, and other gear while I dream of warm, sunny days on the lake. This year it will be held on January 10 – 13 at Georgia World Congress Center and is $15 for adults. 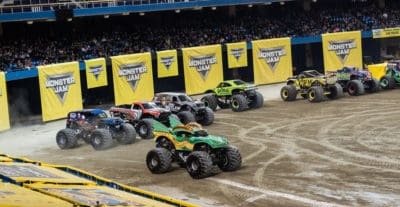 Monster Jam – Who doesn’t love Monster Jam?! The trucks, the noise, the energy – it’s all so great! And the best part!? It’s inside Mercedes Benz Stadium where you’ll be warm J Get your tickets now for February 23 or 24! The Fox Theater – There’s just something about the theater in the winter. Definitely one of my favorite things! The Fox has a fantastic Broadway line up early this year. The two shows on my list are Waitress (running February 5 -10) and Les Miserables (Running February 26 – March 3). Bonus Event: Justin Timberlake at State Farm Arena (formally Phillips Arena). Justin is coming to town on January 10th. If you have tickets and need a friend, call me! If you’re looking to be closer to the action and find a place in the city, give us a call – 678-921-1470. The Peters Company has experienced agents for all of metro Atlanta and surrounding areas!